We begin 2019 with the understanding that the democratisation of information access in the age of information pipelines pioneered by WikiLeaks leads to an increased pluralism of authoritative voices on public affairs, leading in turn to a better quality democracy as these voices educate society. In this respect WikiLeaks as a system becomes an agent of social change. 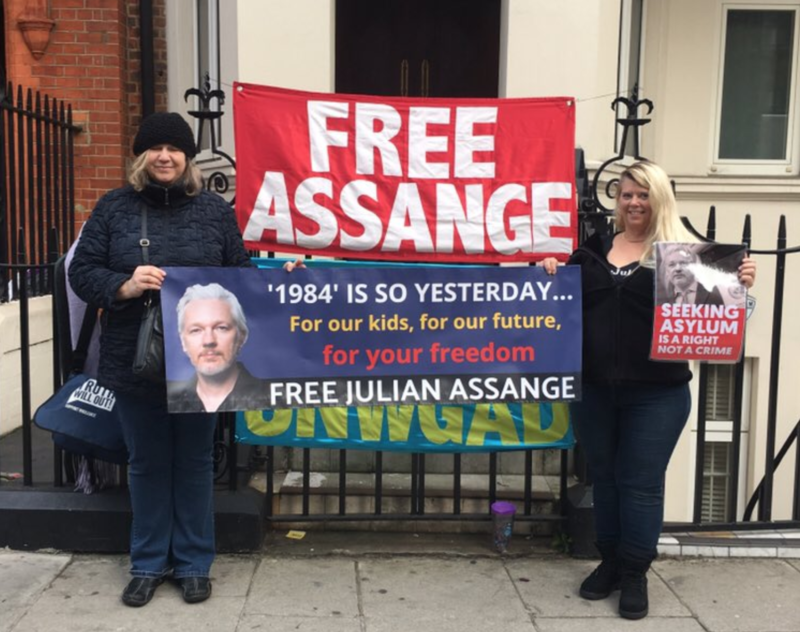 There is a myriad of ways to support their efforts and here are some of the actions taken in January in support of Julian Assange and WikiLeaks. A new year, a new freedom banner beautifully created by Wendy Hijazi with its vibrant colours brings sunshine to Hans Cresent and helps us spread the word to passers by. 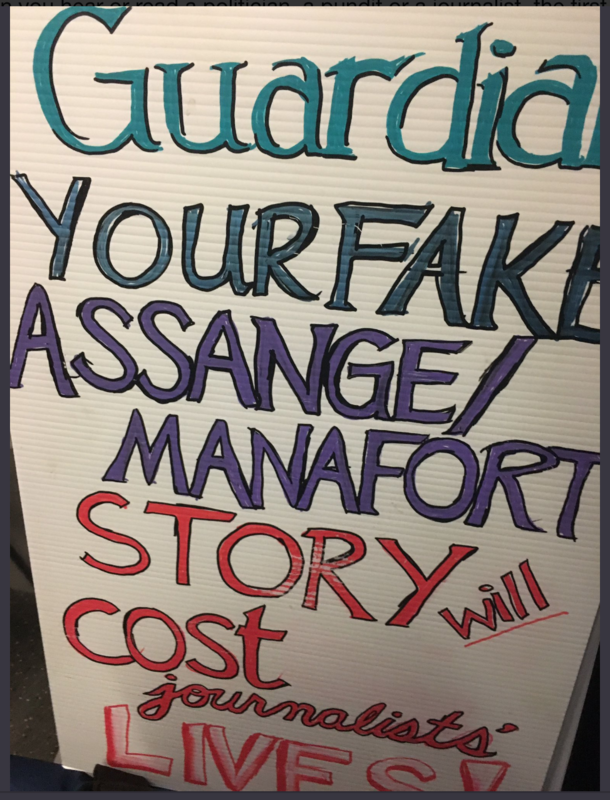 The legal advising twitter account @AssangeLegal has recently said, “The Guardian’s Manafort-Assange fabrication is now jeopardising Assange’s asylum (click ‘updates’) https://www.gofundme.com/wikileaks-suing-the-guardian-over-manafort-story … and Ecuador is now helping US interrogate its own diplomats about Assange and his visitors as a result of Guardian’s front-page 100% fabricated story” . The Guardian’s antagonism towards WikiLeaks had an early start with undermining the publishing strategy of “Cablegate” in 2010, continuing with the extraordinary release of a WikiLeaks entrusted password in a Guardian published book. Since then that news organisation has acted predatory over WikiLeaks news resources, using its releases for its own financial interests whilst at the same time unfolding a systematic and aggressive polemic against WikiLeaks Julian Assange. It is time such a polemic is resisted and in our recent action outside The Guardian offices we had plenty of examples that the general public is on the side of WikiLeaks. 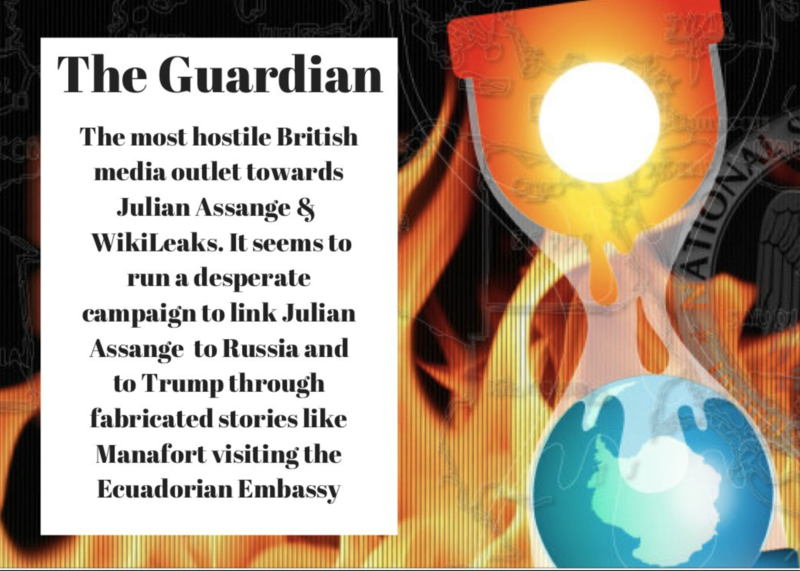 The Guardian shameful record includes an early Editorial position to campaign for his extradition to Sweden, to a barrage of negative articles about WL and Julian Assange regularly being hosted to its pages over the years, to the more recent despicable fabrication of stories clearly enabling an international conspiracy to engulf WikiLeaks and Julian Assange personally in legal trouble and imprisonment for Espionage. Whilst we can admire journalists for their courage and integrity we can also recognise them for what established media organisations are, political agents that can act both self serving as well as agents of dark unaccountable interests within the state apparatus. Whether The Guardian is directed by the UK secret services to act in this unethical way, whether it lacks the editorial integrity to properly vet the veracity of its claims or it is simply motivated from a sense of false patriotism in serving the UK intelligence services, we cannot but call this injustice out. We shall return outside their offices regularly to let our voice be heard. This January action was reported in German here. A lighthearted report of interacting with the UK intelligence services outside the Ecuadorian embassy is offered below. Let’s make no mistake, this publicly funded ‘covert’ Operation Kudo does not serve our interests as citizens and residence of this country. With real cutbacks in public services our tax money are wasted in surveilling and undermining the operation of a media organisation WikiLeaks. Metropolitan police has in the past published the cost of its operations in the name of transparent government but in this case once the uniform police presence that cost us a staggering £13.2 million was removed in October 2015, the MetPol has put forward National Security, Law Enforcement, International Relations, Health and Safety reasons to refuse disclosing how much of our tax it has spent and is spending. 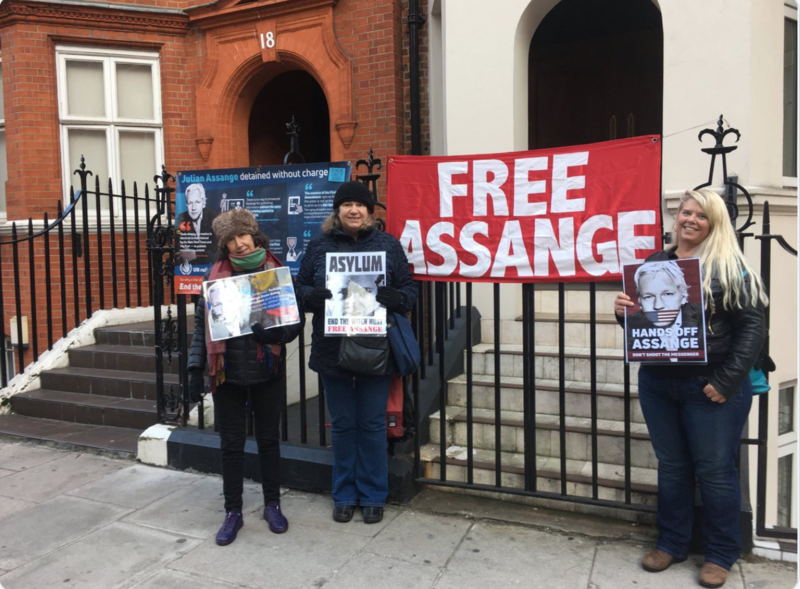 The regular solidarity vigil continues its actions outside the Ecuadorian Embassy rain or shine Tuesdays, Wednesdays, Thursdays between 3 and 5 in the afternoon. 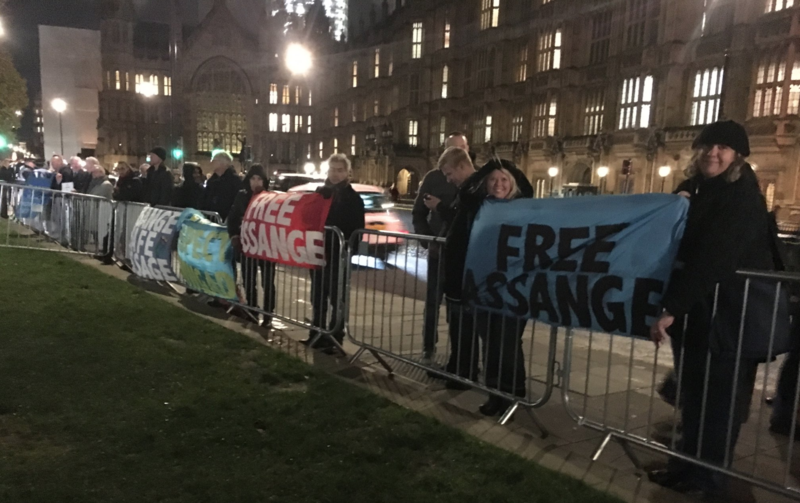 Wrap up well and join in this simple act of solidarity, standing up for Julian Assange’s human rights. With the country in heightened grassroots mobilisation due to the Brexit debates at the Houses Parliament, we were inspired to join people outside Westminster House of Commons during the no confidence vote Theresa May’s government was facing to simply declare that we have no confidence in her government’s record in upholding Human Rights or respecting its International obligations in the case of WikiLeaks’ Julian Assange as per the recent UN declaration. “The WGAD is further concerned that the modalities of the continued arbitrary deprivation of liberty of Mr. Assange is undermining his health, and may possible endanger his life given the disproportionate amount of anxiety and stress that such prolonged deprivation of liberty entails.” and “It is time that Mr. Assange, who has already paid a high price for peacefully exercising his rights to freedom of opinion, expression and information, and to promote the right to truth in the public interest, recovers his freedom,” the experts concluded. 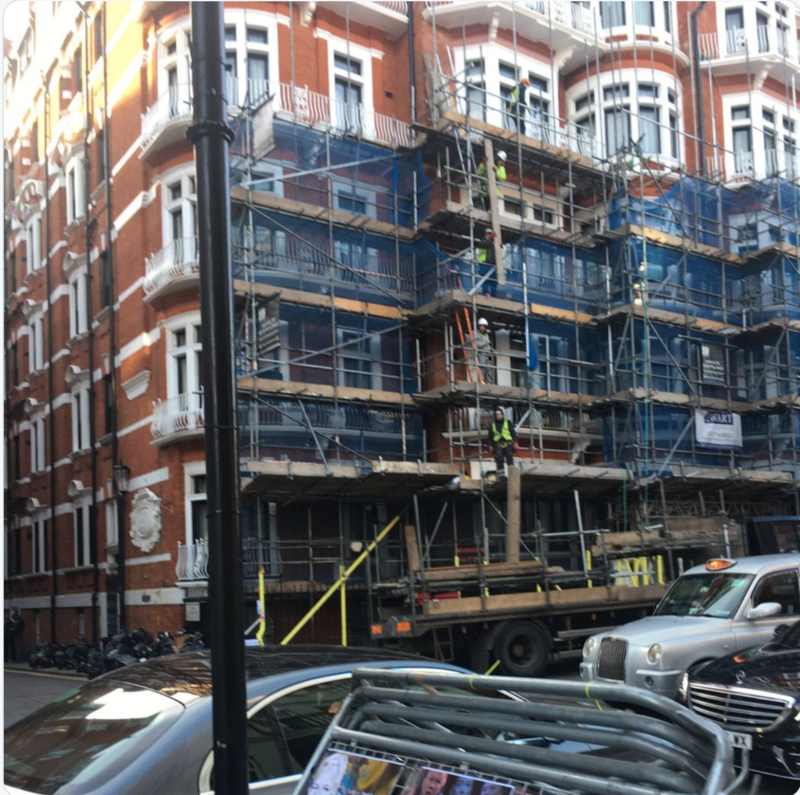 It has been many weeks now that Ciaron O’Reilly has been keeping a Catholic Worker 24/7 vigil outside the Ecuadorian Embassy vigil for Julian Assange. You can support his efforts by contributing to his costs here. Listen to what he has witnessed about the police operation in the video below created by ‘Lessons for Life 24/7’. 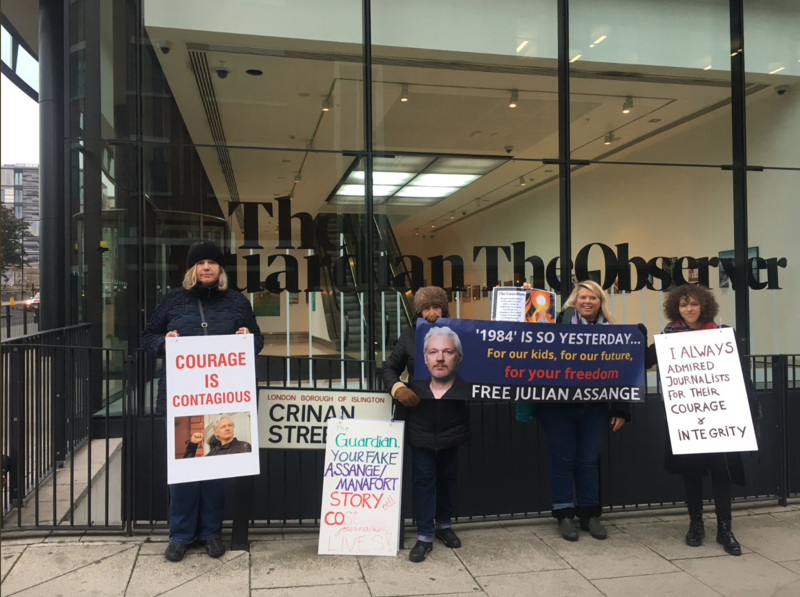 Delighted to see the Courage Foundation adding its weight in launching a Letter writing campaign in support of Julian Assange. Many have already written to their MP’s asking the UK government refuses his extradition to the US. This is a most important supportive action, we live in a democracy, let’s exercise our rights and let our opinions be known in the corridors of power. Here is a handy template we can use to write to our MP. Two years ago Nozomi Hayase invited us to “celebrate this publisher of last resort —this fierce vanguard of democracy. Greek philosopher Diogenes once said, “the most beautiful thing in the world is free speech.” WikiLeaks, the innovation of stateless journalism on the Internet is perhaps the most beautiful thing that has happened in the world for decades and it continues to grow.” It is because of WikiLeaks publishing that Julian Assange is arbitrarily detained all these years. His resistance to be silenced and dogged persistence to publish continues to inspire. The candle action at the steps of the Ecuadorian Embassy is very eloquent. The generosity of people in this journey of support for Julian Assange and WikiLeaks is wonderful to experience. We were joined by @NellyTell and her beautiful family who commissioned and donated this beautiful banner which we are putting here to good use. So thankful! The uniqueness of each one defending Truth as the purest way leading to freedom.